Last month, two Air Force officers drove through a snowstorm in Boston, looking for any indoor field so they could have a football workout after a long day of serving their country. One of them was an All-American cornerback a couple years ago. The other a college receiver with measurables that match up well with many of the players who will be drafted later this month. In that snowstorm, Reggie Rembert and Spencer Armstrong eventually found a field at Harvard. They've been there before, often working out on a field alongside the women's lacrosse team. "We got a bunch of evil looks," Armstrong says. This is the routine for Rembert and Armstrong. They work their jobs with the United States Air Force during the day, and desperately keep the door to their NFL dreams pried open at night. They know and understand why they haven't been signed by a NFL team yet. All service academy players with pro dreams eventually learn about the obstacles, most notably the minimum two years of active duty that they have to do after graduation. Their big chance to impress NFL teams comes Sunday and Monday at Cowboys Stadium at the NFL's super regional combine. All 32 teams will be represented at the event, which has most of the same drills as the more well-known NFL scouting combine in Indianapolis. Rembert, Armstrong and two other younger former Air Force players, Alex Means and Asher Clark, are among the 218 players who were invited. So were former Army linebacker Josh McNary and Navy running back Gee Gee Greene. Service academy players don't always get this kind of chance. "All I need is a shot," Rembert said. "I've been busting my tail for two years for this opportunity." Service academy players don't go to Army, Navy or Air Force just to play football. This fact is reinforced to them constantly. They are there to become military officers. The tradeoff is pretty good though. They have guaranteed jobs making pretty good money upon graduation. Rembert didn't necessarily go to Air Force figuring he'd have a shot to play in the NFL some day. He went in large part because that and Navy were his only FBS offers. He was overlooked because he was just 5-foot-8. He went on to have an outstanding career and by the end, his pro dreams weren't so outlandish. Rembert was one of 22 players on the AFCA All-American first-team offense and defense in 2010. And 21 of them have been on a NFL roster. Rembert, who was also a third-team Associated Press All-American selection as a senior, hoped to get signed by a NFL team and put on the reserve-military list for two years. Air Force Academy graduates have to serve on active duty at least two years, then can apply for the "Palace Chase" program to turn the rest of their commitment into reserve duty. That's what happened with defensive lineman Ben Garland, who played with Rembert at Air Force and was signed by the Denver Broncos. After two years on the reserve list, Garland was part of Denver's practice squad last year. After Rembert's college career ended, he got some preliminary interest from teams, but no contract. He spent a year as a graduate assistant coach at Air Force, then was assigned to Hanscom Air Force Base near Boston. Rembert, a second lieutenant who is a project manager on early warning radar upgrade, gets up at 6 a.m. to get to work by 8. Many days over the winter it was dark when he left work, but he always dragged himself to a workout. NFL teams didn't see that. They don't know that Rembert considers himself a homebody these days because he spends his free time staying in shape, preparing for his chance to impress. He makes it clear he enjoys the Air Force and is proud to serve his country. But he also wants to play in the NFL. He hopes teams notice a former All-American who has kept pursing that dream for two years when it would have been easy to quit. "I hope teams look at that and say, 'This is a guy who doesn't give up,'" Rembert said. Armstrong, who had the double whammy of injury issues and playing in an option offense as a college receiver, was coming back last August from six months stationed in Kuwait and was stationed at Hanscom. 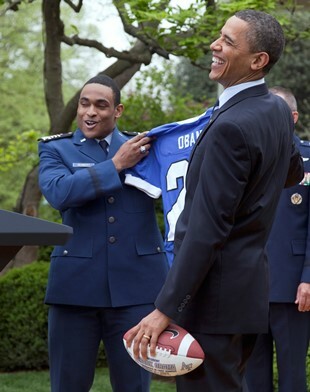 Armstrong, a first lieutenant and contracting officer, started working out with Rembert because he knew Rembert was still chasing his NFL dream. Even though there weren't many opportunities in Kuwait to sharpen his football skills, he found out he still had it. So he started thinking about pursuing the dream too. "It turned into me going along with him for the ride," Armstrong said. Armstrong spent $225 to do a regional combine in New Jersey on March 2. He did enough to advance to the super regional in Dallas (Rembert, based on his college achievements, was allowed entry in the super regional without working out at one of the regional combines). Armstrong ran a 4.57 40-yard dash, which was a little disappointing because he has run in the 4.4s before, but the rest was great. He had a 39.5-inch vertical, which matched the best vertical jump of all the receivers at the NFL scouting combine in Indianapolis this year. He had a 10-foot-5 broad jump and a 4.14-second short shuttle, which are both better marks that aspiring receiver Denard Robinson, for example. He played at 6-1, 195 pounds, so he has decent size too. Armstrong also will turn 27 in June, and realizes this combine at Cowboys Stadium might be one of his last chance at a contract. Although service academies get players who are overlooked by other FBS schools, they do have good players. Air Force and Navy consistently make bowl games. In 2010, all three academies were in a bowl game. You can't do that with just a tricked-up offense; you need players too. Air Force players look to the example of Chad Hall, an undersized receiver who has spent time with the Eagles and 49ers. 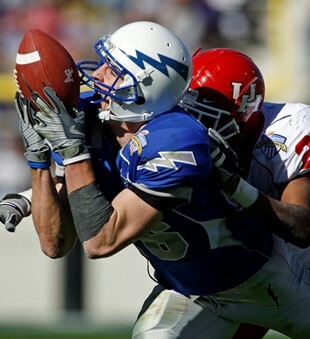 But, since Bryce Fisher retired after the 2007 season, Hall is the only Air Force player to appear in a NFL game. During one of their late-night workouts, Armstrong and Rembert shared a realization. They have good careers and enjoy what they're doing, but there's still a reason they would drive through snowstorms and give up going out on weekends to pursue a dream that seems very unlikely at times. "All this time we've been training, we've never talked about money," Rembert said. "We don't want to make the NFL for the money. We want to make it because everyone has told us we can't."